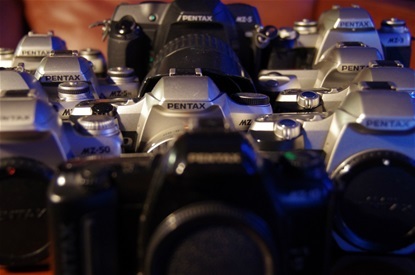 The 11 different MZ cameras from the MZ-5 in 1995 to the MZ-60 of 2004. 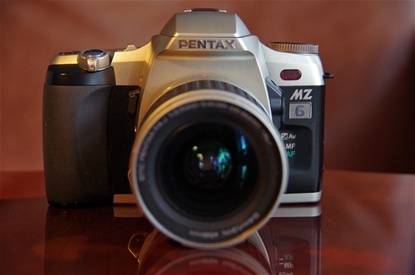 Another camera of the year from Pentax, the MZ-5 from 1995. Small and light, retro style dials, easy to use. I bought it in '96 and used it for some years. Size: 135x90x61,5mm. Weight: 400g. Sn: 7046184. The dials are back! Easy and fun to use. 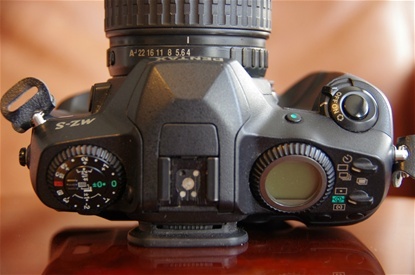 Standard lens is 28/70/4 FA AL. Unlike most MZs, the major part of the 10-models sold were all black. Sn: 8510476. 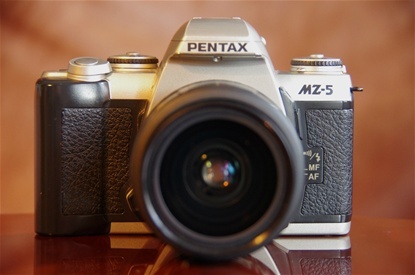 A simpler version than the MZ-5, quite another philosophy behind it. 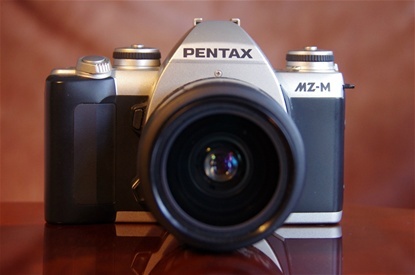 Modes for AutoPict (Camera determines which program will suit the motive), P, Tv, Av and M. Size: 135X90,5X62,5. Weight: 350 grams. The MZ 50 of 1997 was produced for the low end market, following the MZ-10. 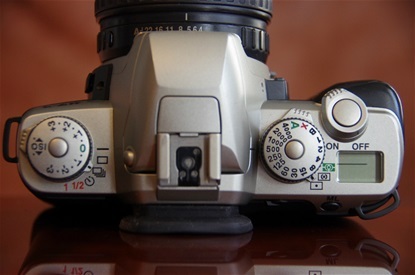 The MZ 50 had limitations regarding K and M lenses, giving less compatibility than the MZ 5 and 10. 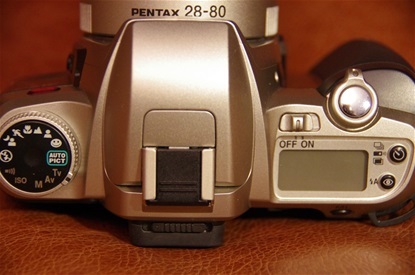 Pentax added a Night Scene program, though. Size: 135x90,5x62,5. Weight: 345 grams. Sn: 7598366. Only minor dfifferences from the MZ-10 on the Mode dial to the left. 1997 really was a year of new models. First the lower end MZ-50, then the new top model MZ-3, the almost identical MZ-5n, and finally the manual MZ-M. 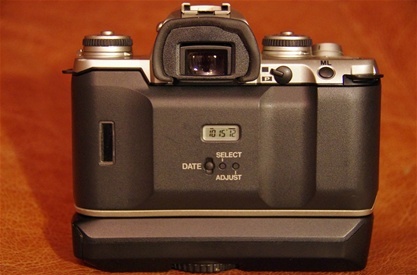 Here the MZ-3 with battery pack. 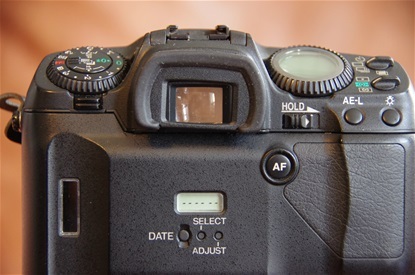 Note the new AF section choice with the button on the cameras right hand side. Sn: 7562738. Size: 135X90X61,5. Weight: 410 grams.. Identical to the MZ-5N, except for the 1/4000 shuter time. 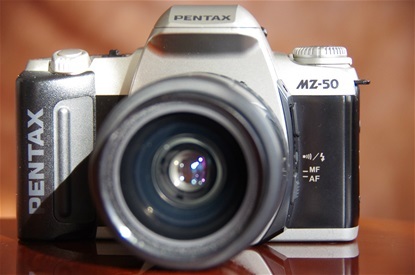 The MZ-5N was released at about the same time as the MZ-3, and was identical except for the 1/2000 shutter time. 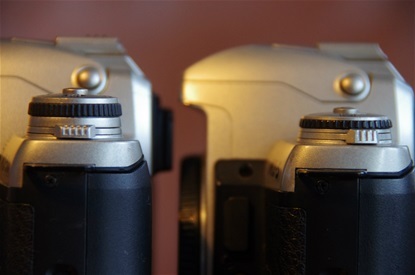 The 3 and the 5N were mostly sold in different markets. Sn: 7660085. Size: 135X90X61,5. Weight: 410 grams. A little redesign from the 5 (lower) to the 5N (upper). In addition, the 5N featured the same AF section choice as the MZ-3, placed on the front wall. 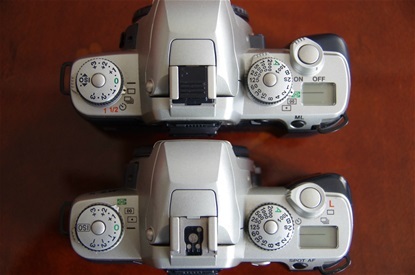 The 5N (left), as the 3, had lifted the dials for better grip. MZ-5 to the right. The M - manual - was meant to take over after the K 1000, with its amazingly long and successful story. But it did not happen. 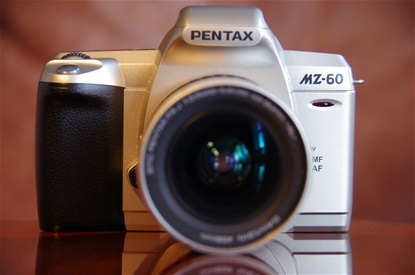 The all plastic M did not give the solid impression of its predecessor, and photo students would rather buy a second, third or fourth hand K1000 to learn the game. Size 135X90X61.5. Sn. 7501393. 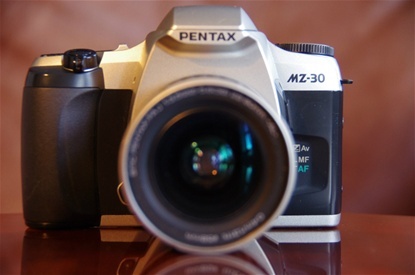 Design and body like the MZ-5, but lacking the autofocus functions and the built in flash, among other things. 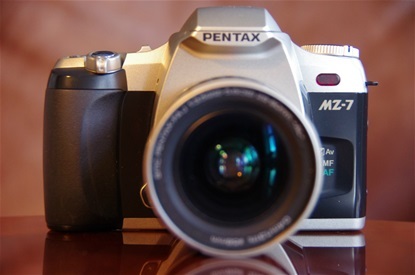 Introduced 1999, the MZ-7 was following the design of the MZ-10 and MZ-50 in functions and controls, as opposed to the MZ-5, the 3, the 5N and the M, who were inspired by the classic cameras from earlier decades. Size: 135,5x92x63,5. Weight: 380 grams. Sn: 1498060. A 35-80/4-5,6 lens, made in Vietnam. Compared to the MZ-50, the MZ-7 had added programs to the mode dial, and some controls were moved to buttons by the window. MZ-7 featured 1/4000 shutter time. 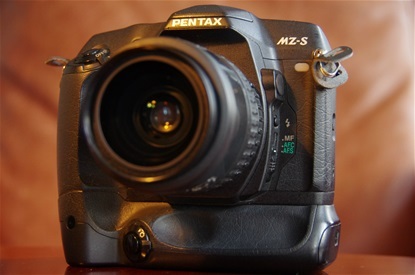 MZ-30. Along the path of MZ-7. Size: 135x92x63,5 mm. Weight: 360g. Sn: 3205423. 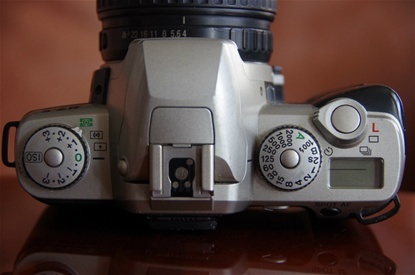 7 auto-program + manual/Tv/Av mode dial to the left. 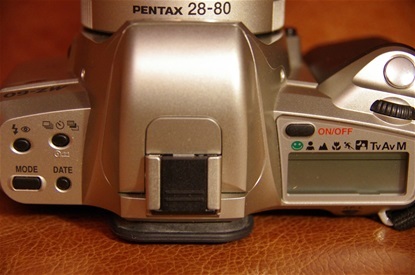 No aperture ring on the lens, nor shutter dial on the body. 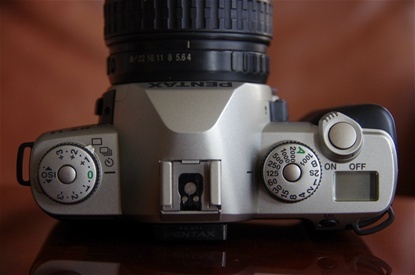 Aperture/shutter is controlled by moving the ring around the shutter release button right or left. 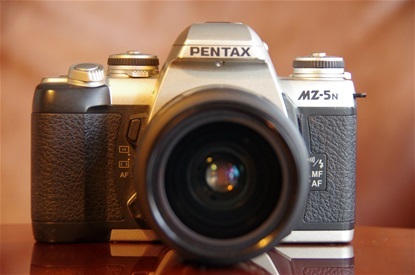 Lens is Pentax SMC FA J 28-80/3,5-5,6 AL, assembled in Vietnam. Sn: 6645714. 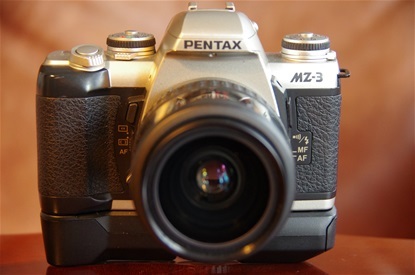 The ultimate 35 film flagship for Pentax, the MZ-S. A dream of a camera, and the last serious 35 film camera from Pentax. Size: 136,5x95x64mm. Weight: 520g. Sn: 4940243. With battery grip BG-10. 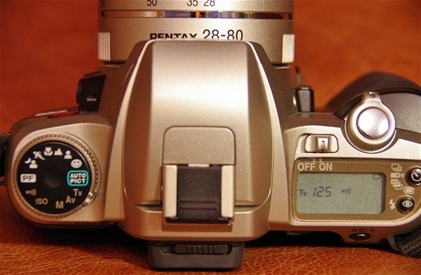 Note the 45 degree angle for controls, making it easier to read and to handle. The MZ-6 was also sold as MZ-L and the US version ZX-L. Size: 135,5X92X63. Weight: 400 gr. Sn: 4187596. 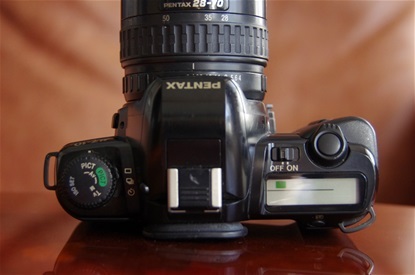 Loaded with options: Night scenes, Sport, Macro, Landscape, Portrait and Green, + AutoPict, letting the camera choose the right program. 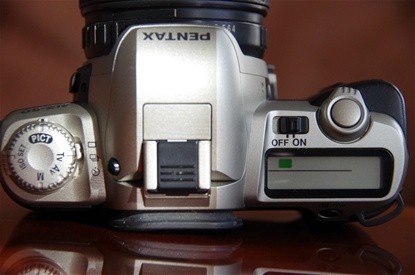 In additition, of course, the Tv, Av and M, and an 11 option personal choise mode, like on the top cameras. Shutter time down to 1/4000. A scaled down MZ-6, more like the MZ-50, but with more options. 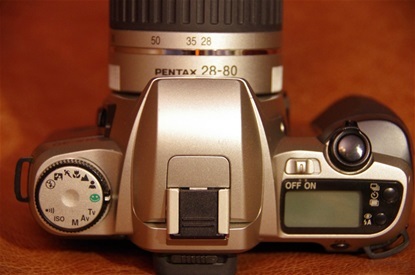 A nice little camera with auto and manual modes. Size: 136x94,5x63mm. Weight: 335 g. Sn: 5489651. Big display with vital information. The only MZ with no dials or rings, only buttons. Also the last MZ. Thank you for this information. I will correct the text. 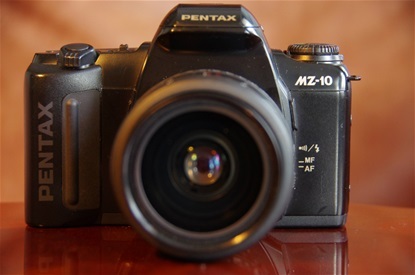 MZ-10 was also made in silver in addition to black. I have one. But the weak spot in the small MZ and ZX bodies, the motor drive gear, has caused it to fail.